Sketched May 18, 2:33 p.m. They call them “hidden gems” for a reason. Several parks mantained by the Port of Seattle near terminals in Harbor Island and the Duwamish River are not easy to find. With names like Terminal 18 Public Access Park or Duwamish Public Access at Terminal 105, don’t bet on Google maps to navigate you either. Note to folks at the Port: How about a naming contest? But don’t be discouraged. Once you get past the railroad trucks, dirt roads and chain-link fences, you’ll relish the discovery. At Terminal 18 on Harbor Island you can picnic on the shade of the West Seattle Bridge while barges and tugs go through the river to your right and locomotives pull rail cars to your left. A railroad switchman was enjoying a break from his job while I sketched. He said people who work at the terminal use the park a lot. 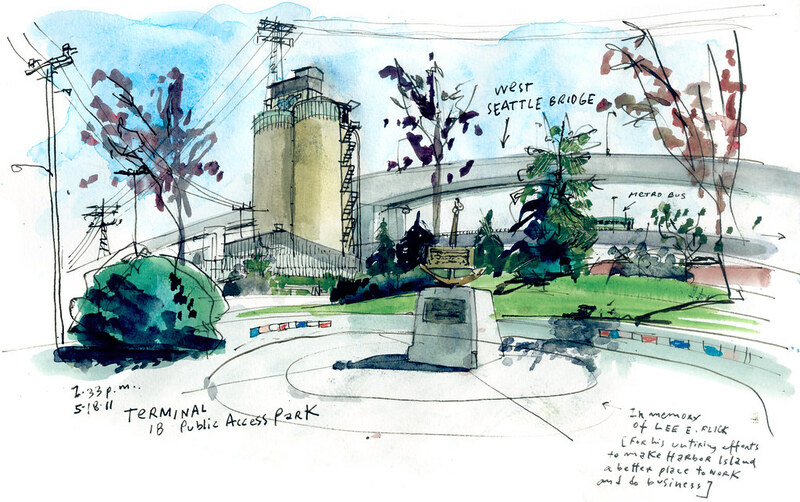 Stay tuned for more sketches of other Port of Seattle Parks.